This is a photo from my childhood – I am standing with a neighbor of ours, Ms. Trudy. She and her sister whom she lived with – Ms. Mattie – were like grandmothers to me. They taught us how to make pickles and their home was a frequent destination. I’d admire their collection of porcelain dolls and my brothers would watch baseball games on TV with them. This is one of the only pictures I have with Ms. Trudy. Although it is blurry, I’m grateful for the tender moment it captures. I write about Ms. Trudy in my book. About how she was one of the first people to model for me what it means to be body-positive. She certainly didn’t use those words. She just lived her life in ways that we call radical now. I write more about what that looked like and how it impacted me at a young age in chapter one. My publisher, Fortress Press, is offering a download of chapter one of Fat and Faithful as well as a discussion guide to everyone who pre-orders. You will receive a link to download the first chapter of Fat and Faithful AND a free discussion guide. If you ready chapter one in these next few weeks before August 1 – I’d love to hear what you think! Whether you use these images as pure inspiration for yourself and others or just want to help me spread the word about my upcoming book, I hope you’ll share them on social media! One warm morning, after nursing my son, I was sitting on my bed with him in front of me. I was in a nursing sports bra and shorts, he in just his cloth diaper. That morning he officially turned 20 weeks old. I started telling him about what things were like 20 weeks ago, when he was first born. Upon hearing my voice and seeing me interact with him, he smiled and started excitedly kicking his feet. I told him, “Not too long ago, you were kicking me from the inside, now you’re kicking me from the outside!” and tickled him. He squealed with delight and kicked harder. The heel of one of his feet hit my stomach and sank into it pretty far. He pulled his foot away, and repeated the movement, alternating both feet, an expression of great concentration on his face, fascinated by the squishy surface into which he was pressing his feet. A happy moment immediately turned into one of embarrassment, and I felt hot all over as shame washed over me. I looked down at my stomach, lined with stretch marks, and felt disgust. My inner voice told me, “One day he is going to be ashamed of you. He won’t even want to be seen with you in public. You’ll just embarrass him.” I stood up and scooped him up, holding him against me. I looked in the mirror and was struck by the contrast of our sizes.He picked that exact moment to start squeezing and pinching my upper arm. I turned away from the mirror, too ashamed to look any more. When I first learned that I was pregnant, I immediately asked God to give me a boy. Being fairly new on my journey towards body positivity, I didn’t want to risk causing a daughter to have the same issues that I had. While I know that boys can be insecure in their appearance as well, I felt like having a son was “safer” somehow. I was so relieved when I learned that our little one was male! As I carried him within me, I promised him that I would never cause him to feel as though he was not good enough. I pledged that I would never, not even when he was a baby, speak ill of my body or anyone else’s, and if I heard someone else do it, I would make a point to say to my baby, “We don’t talk about people’s bodies that way, because there is no right or wrong way to have a body.” I had the best of intentions. That evening, after feeling ashamed of myself in front of my infant son, I told my therapist about the situation, how my squishy tummy was entertaining to my baby. Saying it out loud, I felt ashamed all over again — both of the situation and my response to it. I was enjoying my baby, interacting with him, playing with him, and I ended it because I had an emotional response to an innocuous behavior by my baby. While we processed it, I thought of other ways he has interacted with my body. While nursing, he will press on my breast or stomach, palpating it, almost as if the softness comforts him. He squeezes my upper arms and smiles. He will reach up and squeeze my chin. He nuzzles into my bosom when tired. He turns to me, my body — as it is now — for comfort. He loves me, all of me, as I am. This body, as it is now, carried him for 39 weeks and five days. It nourishes him. It cradles him. It comforts him. It protects him. That sounds like an amazing goal body to me. This body belongs to his mother. And he accepts it, without question. I can either let other peoples’ perceptions of what a good “goal body” looks like cause me to question my own motherhood, or I can choose to be a good mother right now. Deciding that my body is a reason to hide, to be ashamed, and to judge myself will only take me away from these innocent moments where my son doesn’t know what fat or thin is. My therapist pointed out that If I carry myself in a way that shows that I am embarrassed of myself, or I refuse to go out and engage with the world, he will think that there is a reason to be embarrassed. If I go out and do things with him and not allow my size or fear of judgment affect me, he won’t be embarrassed. I can say that there is no right or wrong way to have a body until I’m blue in the face, but if I act like my body is a wrong body, it will mean nothing. A few days later, I went to the zoo with a friend. I briefly agonized over whether I should wear a sleeveless shirt. Ultimately, I dressed comfortably, and had a great time at the zoo. I posed in pictures with my son. After looking at the pictures, I immediately noticed stomach rolls and flabby arms. I looked again, and saw a mom with her son, having a great time and making memories. There is no reason to hide. When my son looks back on these pictures, I hope he doesn’t see an embarrassment; I hope that he sees a mom who loves her son and took him to the zoo. Regardless of whether or not I achieve society’s standards of a goal body, I hope that my son learns that our bodies, as they are, are worthy. Loving them should not wait until or unless a change happens. Our bodies, as they are, are good. As long as we use them to love one another and be there for one another, they have already achieved a goal. Also, squishy tummies are fun for kicking. I am guest-posting today at a new website dedicated to providing resources for fat Christians. I hope this article is helpful both for pastors and church leaders and for fat Christians who feel unseen. As a teenager, I professed faith in Jesus at a summer camp in the mountains of Tennessee. I remember badly wanting to ask my youth pastor to baptize me right there, that week, in the pool on the college campus. Not because of any spiritual urgency, but because I was afraid that if I waited to return to church the next week that there would not be a baptismal robe large enough to fit me. My adolescent reserve won out and I waited until we returned to our church to be baptized there. The robe was snug, but did technically fit. A few years later after I was finished with my white high school graduation robe, I donated it to the church and told them to keep it in their baptismal robe supply – just in case. There are a variety of ways that our churches can be inaccessible to people of size. Often church leadership doesn’t know to look for these areas and church parishioners don’t know they are allowed to speak up. I sat down to talk with my current pastor, Brian Wright, D. Min., about these issues. This article provides some starting points to make your congregation welcoming to people of diverse body sizes. Wright worked as an eating disorder counselor during his undergraduate days as a psychology major, ministered as a pastor for many years, previously served on the board of the Interfaith Disability Network, and is currently in medical school to become a doctor. In other words, he is an excellent person to talk with about the intersections of faith and bodies! I had the privilege of writing an article for Christianity Today this week. It is very common for me to hear, “I can’t believe churches talk about weight loss!” Or, I have people who have a long history with church tell me they don’t remember their church talking about weight-loss. (My instinct here, given that people who went to the same church I did tell me this, is that weight-loss at fat-shaming is so common in our churches we don’t even notice it.) However, I also hear from countless people who have. In addition, my research has easily produced countless faith-based weight-loss resources. So, I never question whether or not it’s worth it for me to talk about body-image in the church. But, the next time someone tries to tell me I am imagining things, that I am too sensitive or in-tune to the idea somehow, I am going to show them the 2015 Christian Book Awards. Warren says that the goal is to make “health a form of worship [because] God made your body, Jesus died for your body, and He expects you to take care of your body.” This is not an inherently body-shaming approach, but the cultural connotations of “take care of your body” get us quickly there. I have no problem advocating for people to take care of their bodies as well as they can. I just believe that including “weight loss” in that care speaks more to our cultural obsession with thinness than it does to physical, mental, or spiritual health. I take care of my body by honoring what it does. I take care of my body by providing it with food when it’s hungry, exercise for enjoyment and strength, rest when it’s weary. I take care of my body my monitoring my health. I take care of my body by not assuming it’s bad and diseased just because of the size of my dress. The “inspiration” behind Warren’s diet books, as reported in an interview with the Wall Street Journal, came to Warren while he was “doing baptisms ‘the old-fashioned way’—by physically raising and lowering people into the water.“ Warren said that as he was “lowering people, [he] literally felt the weight of America’s obesity problem [and] thought, ‘good night, we’re all fat!’” There were reportedly 850 people that Warren baptized that day, certain to qualify for some tired arms for the pastor no matter the size of the people. What strikes me, as a person who once waded into baptismal waters with jiggly thighs and a snug baptism robe, is that this sacramental moment that tells us of new life and being made holy became a moment of judgment on the very people who were commemorating their new life. And that judgment produced a book to add to the ever-growing collection of how we don’t get it right enough to be acceptable as we are. While 850 baptisms is certainly tiring, I also wonder about what it was that triggered Warren’s “we’re all fat!” revelation. Water is friendly to gravity, theoretically easing the force needed to lift. I wonder if it was the sight of wet clothes clinging to every roll and wave of the bodies that walked out of the pool that made Warren want to rid his field of vision of this “unpleasant” sight. 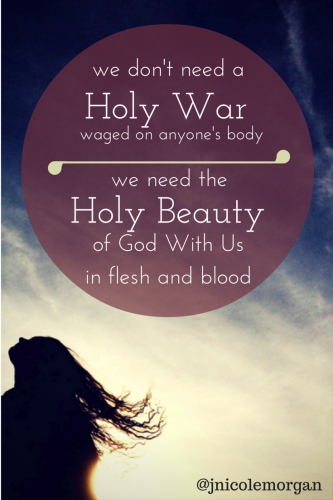 I don’t need a holy war waged on my body. It’s almost summertime. If you haven’t already seen them, you’ll start seeing the “Get your body beach ready!” advertisements floating around as we head into summer in a few weeks. 1. They are trying to sell you something. You don’t need it. 2. If you have a body, it’s beach (or pool or gym or family picnic) ready. 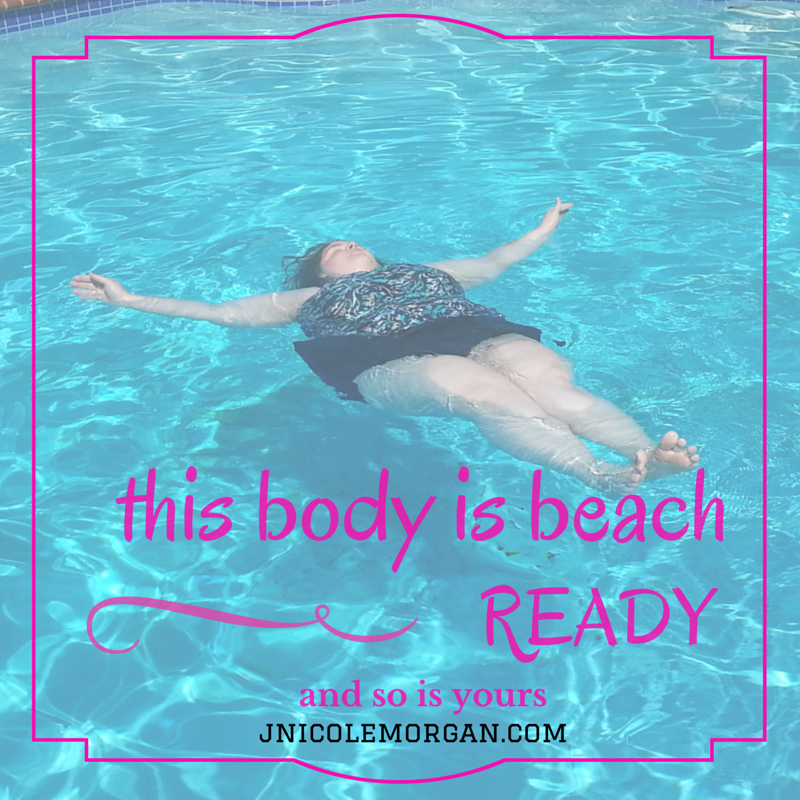 If you have a body, you are beach body ready! If you appreciate this reminder, feel free to share on your favorite social media network.